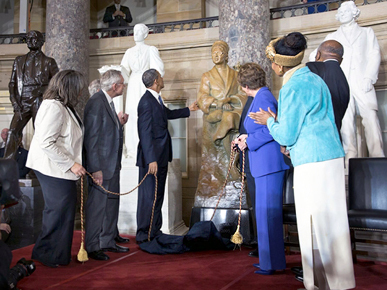 President Barack Obama touches the Rosa Parks statue during the dedication ceremony in Statuary Hall at the U.S. Capitol in Washington, D.C., in February 2013. Pictured with the president, from left, is Sheila Keys, niece of Rosa Parks; Majority Leader Sen. Harry Reid, D-Nev.; House Speaker John Boehner, R-Ohio; House Minority Leader Rep. Nancy Pelosi, D-Calif.; Assistant Democratic Leader Rep. James Clyburn, D-S.C.; and civil rights activist Elaine Eason Keys. Courtesy of the White House. Photograph by Chuck Kennedy.